To Canadians, he’s known simply as the TSN Hockey Insider. 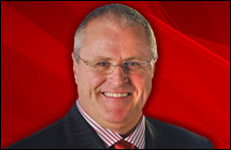 Bob McKenzie provides insight and commentary as an analyst for TSN’s NHL and international hockey coverage. McKenzie also continues to file updates and breaking news for SportsCentre, as well as write his popular Hockey Insider feature on TSN.ca, Canada’s leading sports website. In 2008, McKenzie won the Gemini Award for Best Studio Analyst for his work on the 2008 IIHF World Junior Championship: Gold Final. This marked McKenzie’s first Gemini Award win and his second consecutive nomination in the Best Studio Analyst category. McKenzie has been covering hockey for the past 30 years and is one of the most respected analysts in the business. His unparalleled contacts in the hockey world, combined with an abundance of hockey knowledge and a genuine love for the game, make McKenzie the most well-informed, trusted and connected man in the business. McKenzie joined TSN in the late 1980s as an analyst on SportsCentre and Molson That’s Hockey, and has been a fixture on the network ever since covering the NHL, IIHF World Junior Hockey Championship, NHL Draft, NHL Trade Deadline and five Olympic Games including the Vancouver 2010 Olympic Winter Games. McKenzie’s considerable contributions to the game have been recognized by The Hockey News over the years, as he has been selected nine times as one of the game’s 100 most powerful and influential people. Prior to joining TSN, McKenzie was the editor-in-chief of The Hockey News for nine years and a hockey columnist for The Toronto Star for six years.